GERMAN-BORN Denise Kirchner shares her favourite eateries, tasting her way around Melbourne from spatzel to French ribs to vegetarian dinners and coconut cocktails. Okay, so I’m German. I’ve been in Melbourne for more than a year now and I really love it, but I still treasure where I’m from, especially when it comes to food. Sure you always connect home with fond emotions, memories, stories, family and friends, but nothing reminds me of Germany more than food… and that makes me miss my grandmother’s sauerbraten mit hefeknödel, beef with dark, sour savoury sauce and bread dumplings. Mmmh, my mouth gets excited just thinking about it. Normally I don’t think about German food too often because I love the variety of cuisines Melbourne has to offer. But I recently indulged my appetite for my home cuisine by saying “Guten Tag” to Hofbräuhaus, the German restaurant in Market Lane. Get a taste of Germany at Hofbrauhaus, 18-28 Market Lane, Melbourne. should mention here that most people I meet in Australia seem to think all Germans wear lederhosn (leather breeches) and dirndl (traditional dress), which is what the wait staff at this restaurant were wearing, and love accordion music and DJ Ötzi. Just so we’re clear, I have never seen my friends in Germany in lederhosn. Lederhosn is the style of Bavaria, one of the 16 federal states of Germany. Accordion music, on the other hand, is only fun after some schnapps and even then it still only appeals to the older generation. But back to the food. I had bread dumplings, which were nearly as good as the ones my grandmother makes. I washed them down with rindergoulasch, a traditional beef stew with homemade buttered spatzle served in an iron pan. Technically, it’s a Hungarian dish, but we eat it all the time in Germany, so I can’t complain. You can’t eat at a German restaurant and not have bier. As much as I love German food, I must admit, I felt absolutely stuffed and heavy after my dinner at the Hofbräuhaus, not that I was surprised, feeling full and heavy is normal in Germany… it’s good to have a full stomach. 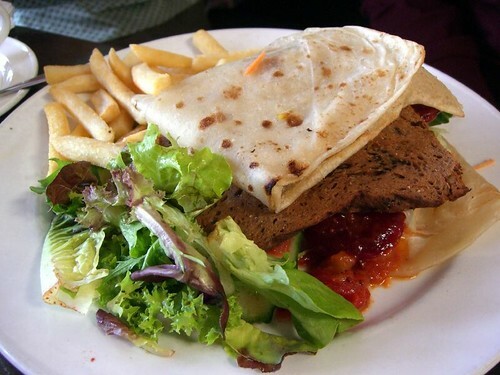 But while I do sometimes like to indulge in a taste of my home country, the one thing I love the most about Melbourne is the variety of cuisines on offer. I am always on the lookout for new restaurants. Most of them don’t serve German food, but that doesn’t make their menu any less tasty. One restaurant I am simply raving about at the moment is the Wayside Inn on City Road, South Melbourne. It’s a new kind of pub called a gastro-pub, which I think means the food is great, but also affordable. The Wayside Inn is located at 446 City Road, South Melbourne. When we got there, we were given a choice between the bar menu, where you can get lunch for just $12, and the restaurant menu. I was there with friends, so we chose to share a bunch of things from the restaurant menu and sit outside. For starters we had a giant seafood platter containing 10 different types of seafood. I can’t remember them all, but I do remember the clams, crab, calamari and prawns. Overall it was a really good starter. After that we shared the rib of beef with the most amazing sauce I have ever had. It was a Bernaise – a rich butter sauce with herbs, Tabasco and vinegar. It was so savoury, perfect for the medium rare rib and satisfyingly French. We also tried something called, ‘Pig’s trotter Pierre Kofmann’. The chef named the dish after a former chef from his travels. Plateau de la mer at the Wayside Inn. Again it was a French, not Australian dish, and I was so impressed. In Germany we have different cuisines, but nothing like Melbourne. In Melbourne you can taste and savour dishes from all over the world all in one day if you want to. That is amazing. I mightn’t have been in Melbourne long, but I already know I would miss the food if I left. My life feels a little bit richer every time I try a dish from another culture. If I had to choose between German food and the world cuisines of Melbourne, I wouldn’t be able to decide. I’d take all. If only I could ship my grandmother here, life would be perfect! In my time here in Melbourne, I’ve also become well acquainted with the humble vegetable. Before I came here, I never imagined I could have dinner without meat. 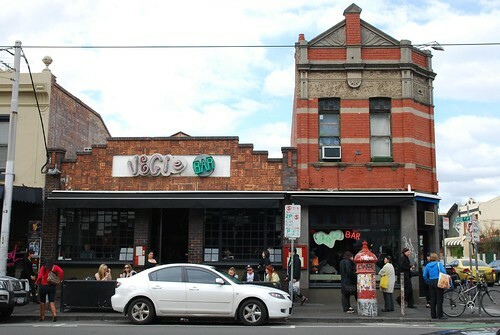 But then Melbourne showed me the Vegie Bar on Brunswick St in Fitzroy. At first discovered it online, and then I decided to check it out. I was drawn in by the rustic and warm atmosphere and excited by the wall of specials. On my first visit, I picked an item from the specials – tofu with udon noodles and mushrooms, which was absolutely delicious. On my second visit, I stuck to the menu and had baked mushrooms with quinoa. Oh and let’s not forget the baby coconut, served opened, chilled with two straws and a spoon. Such a nice, natural cocktail (it makes you feel like you’re on an island… except if you were, you probably wouldn’t have the straws), which added the perfect touch to a really scrumptious vegetarian meal. When it comes to food, Melbourne is a city to discover, every minute of every day. What restaurants have you discovered in Melbourne, and where do you go to eat for a taste of home? Vegie bar is awesome! Other readers should check out their burgers they are AMAZING!